1. 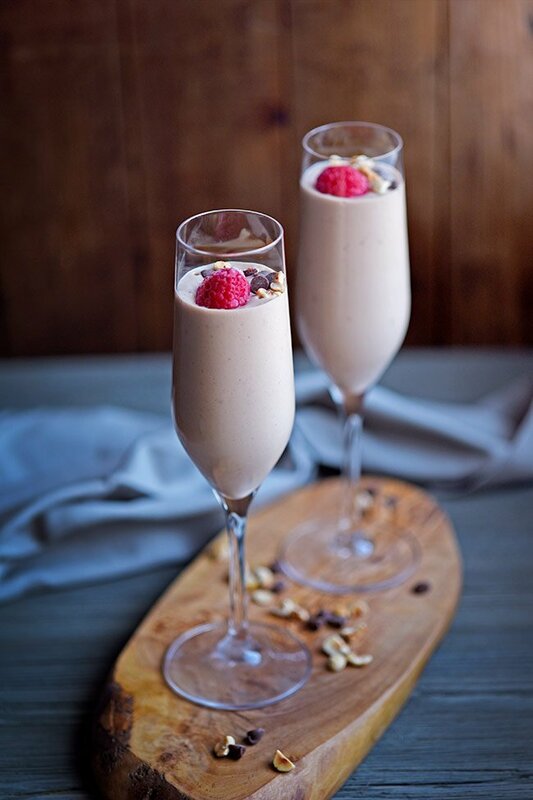 Blend chocolate yogurt with Kahlua and raspberries until smooth. Blend in honey if you taste it and would prefer it to be sweeter. 2. Pour into champagne flutes. 3. Garnish with a single raspberry, a few chocolate chips and a sprinkle of chopped hazelnuts. Enjoy! Spiked — YES. This is a dessert and a cocktail all in one. Woot! To make it virgin, just replace the Kahlua with milk. Chocolate-Raspberry — May be my favorite combo ever. Yours too? Yogurt — Similar to regular mousse but healthier, yummier and a lot easier. Win-win-win! What does this boozy raspberry chocolate yogurt mousse taste like? Now that we’ve broken that down, let’s talk about what this dessert cocktail is like to consume! 🙂 Well, first, it’s pretty thick. You can sip it but you probably want to go ahead and dig in with a spoon. It’s made with chocolate yogurt but you could also use plain yogurt and add chocolate syrup or chocolate chips. However, there’s a special place in my heart for Stonyfield chocolate yogurt because it’s ridiculously delicious all by itself. SO, I’m not sure this would be as good if you tried it another way. So, no guarantees but in a pinch, if you can’t find that brand of yogurt, there are other options. Play around with it and see what you like best. Or keep it simple and just find a chocolate yogurt you like. Last thing you’re going to need to know is that you need a blender. Need one? Check out this KitchenAid blender. Love raspberries in your drinks? Well then be sure to check out my raspberry gin fizz recipe. Making this spiked dessert for a New Year’s or holiday party or for a Valentine’s Day dessert? This Boozy Raspberry Chocolate Yogurt Dessert recipe was featured on Back to my Southern Roots!